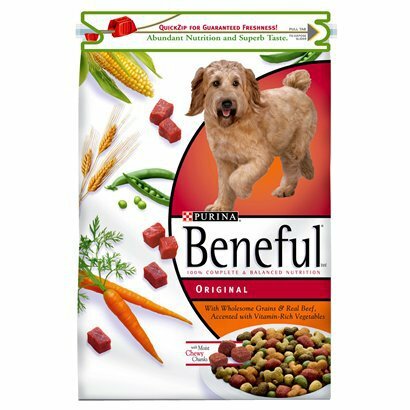 It was about 5 years ago I first reviewed Purina Beneful for PetFoodRatings.org, a long time before all the rumours about the food “killing dogs”. I’ve seen little factual evidence that backs up these claims, but the facts are clear as day on the label that this is a diabolical food. Purina are fortunate enough to have a great deal of marketing clout; the reason being they sell rubbish food in the millions to pet owners who don’t know any better, and make a great deal of profit in the process. The main ingredient in Beneful is wholegrain cereals, a mixture of wheat and/or corn. Both of these grains have little nutritional value, with wheat being the top cause of allergies in dogs. So why would they be used as the primary ingredient? The answer is simple – it’s cheap. The main animal protein source is meat and meat by-products, which includes the worst parts of an animal including heads, beaks, feet, and so on. We don’t even know which animal, and stating with beef doesn’t really say much! Vegetable and vegetable by-products is waste from the food manufacturing industry, meaning it’s all the left over rubbish that isn’t fit for human consumption. The composition can be anything, from potatoes and carrots to traces of plastic and glass. It’s not a quality ingredient. The food get’s worse from here on in. The fourth ingredient is sugar, which is a disaster. It’s added to encourage a dog to eat the food. You may let your kids eat sugary food knowing it isn’t good for them, and it’s the same for pets. Feeding your much loved dog Purina Beneful is on par with feeding your kids McDonalds as a regular diet. Actually it’s worse. Next in the list is salt, another ingredient we know isn’t healthy, and it should never be this high up in the ingredients list. So what do we have as a whole? We have waste products from other manufacturers, so disgusting that even a dog wouldn’t eat it. To compensate they chuck in sugar and salt to make it marginally palatable. And that’s what you’re paying for. It wouldn’t surprise me if Purina Beneful “killed dogs”. It certainly won’t leave your dog healthy. 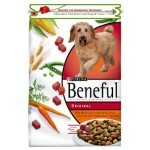 * Guaranteed analysis for Purina Beneful is, for some reason, not listed online. To save me walking down to my local Coles I decided to fabricate the analysis instead. Wholegrain Cereals (wheat and/or corn), Meat and meat by-products (including beef), Vegetable and vegetable by-products (including soy, carrot and peas), Sugar, Salt, Minerals (including calcium, iron and zinc), Humectant, Preservative, Essential amino acids, Vitamins (including A, E, B12), Food colours, Emulsifier, Natural flavours, Antioxidants.